Self Adhesive Pocket and Wallet Prices produced in our East Anglian premises. The prices shown on this page are for our stock range of self adhesive pockets made in 140 micron clear PVC. They all have clear permanent adhesive backing. A3, A4, A5 and A6. Other sizes available, prices on request. 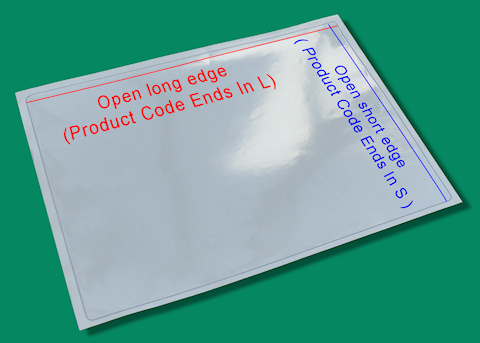 Most of our self adhesive pockets come with the opening on either the long or short edge. Our Product Codes denote this by them ending in either /L for open along its long edge, or /S for the opening on its short edge. Please state this clearly when ordering.